Carson 3D ED Binocular Review: Worth your hard earned money? Carson has been a well-known manufacturer of high end binoculars for a number of years now. They also make monoculars and microscopes, so these guys know their optics. The Carson 3D Series High Definition Binoculars with ED glass has a big reputation to live up to. Let's find out if this binocular can live up to the Carson name. I have had a number of readers ask if this is a night vision binoculars. It is not. The 3D ED does perform well in low light conditions. I have used it when hunting and bird watching, and was impressed with the bright and sharp images at dusk and dawn.? America's Best Binocular Warranty. Really? Worth your hard earned money? The Carson 3D ED comes in a variety of different sizes, and in three colour options. The 10x42 is a popular choice, but Carson Optics also offers a 10x50mm, 8x32mm and 8x42mm option. The three colour options are: black, grey and Mossy Oak camouflage.? The only other binocular with ED glass that comes close to the Carson 3D, is the Bushnell Legend. I believe that accessories are sometimes used to sweeten a deal when the actual product isn't quite up to scratch. This is not the case with this binocular from Carson. We have already established that this is a really good product. 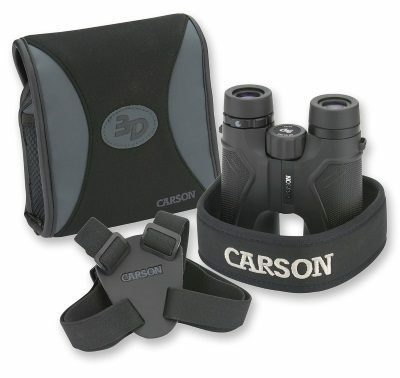 These accessories were well thought out by Carson Optics, and definitely add value to this binocular. Buying these accessories separately could easily add up to $100. The innovative BinoArmor case especially is a product good enough that Carson could sell it by itself. It is clear to see that alot of thought and attention to detail was put into the design of this case. The neck strap is comfortable, and will save your neck.? And for those needing the extra comfort that these won't be dropped, the shoulder harness is a good option. The Carson 3D Series comes with extra long eye relief, meaning it works very well for those wearing glasses. The eye relief comes from the innovative Twist-Down eyecups, a very neat feature indeed. This pair of binos sit really well in the hand, and they are very comfortable when in use. The images are high in contrast thanks to the ED glass. The clarity and depth perception makes the 3D series perfect for use while hunting, or when watching birds. The rugged and shock proof design ensures you won't be too worried when dropping these. Take these with when camping or hiking. It can handle? the great outdoors! Not only is this binocs easy on the eyes, they are comfortable in hand. Carson has taken great care to ensure the texturing is done just right. Something which other manufacturers get wrong more often than not. The thumb grooves are just perfect for my average sized hands. I can see that someone with larger hands might find them in the wrong spot though. For a full size binocular, the 3D ED is surprisingly light in weight at 1.4lbs. Carson claims that they provide America's Best Binocular Warranty. Pretty big claim that, if you ask me. 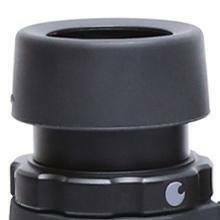 Their No-Fault, No-Hassle warranty will replace or repair your binocs free of charge. Regardless of the cause of the damage. If you are on the fence about these binocs, this warranty is excellent. Many manufacturers (not only binocular manufacturers) will make you jump through hoops when returning damaged goods. Carson is a breath of fresh air with their unique approach. Is it really America's Best Binocular Warranty? It sure looks that way on paper. I haven't had to return a binocular to them just yet, so the verdict isn't in just yet.? I can't help but feel that Carson missed a trick by not including Carson specific lens covers. They provide a good set of well made accessories with your purchase, and those lens covers would have rounded the package quite well. While the eye cups provide excellent eye relief for those wearing glasses, incremental adjustments would have made it even better. 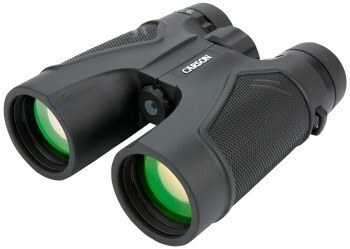 The Carson 3D Series High Definition Binoculars with ED Glass comes in at a solid $410 recommended retail price. This is pretty standard pricing for a set of field glasses with this image quality. You can find it for cheaper on Amazon, which makes it a super deal. While these are a solid buy at $400, it becomes a steal at anything below $300. You won't find binoculars with ED glass close to that price point, much less with similar high quality accessories.